E3 Live™FOR HORSES, organic supplement pure algae designed to solve the toughest hoof and equine health issues. Our horse algae starts with the highest nutritional value AFA blue green algae from Klamath Lake. We are welcoming a NEW Product For Your Dog. No additives, no pesticides and no preservatives. by providing the minerals, vitamins, essential fatty acids and amino acids dog needs. Two Forms for your Dog. Frozen-Liquid and Dry-Powder. 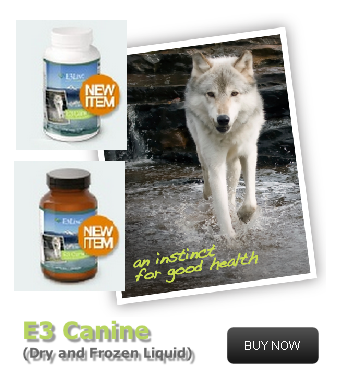 E3 Canine is 100% Certified Organic Aphanizomenon flos-aquae a wild-harvested nutrient dense aquabotanical. E3 Canine is absorbed easily and supports general health, fur coat, joints and brain function; by providing the minerals, vitamins, essential fatty acids and amino acids dogs need. Only Pure trace mineral concentrations and the highest protein are found in this natural food. Thank you for visiting our blog, Come back soon.